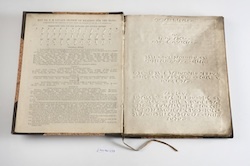 The publication of Mary (mother of Anna) Sewell’s sentimental Mother’s Last Words suggests a continued emphasis on eliciting appropriate moral and emotional responses in blind and visually-impaired readers as presses branched out into fiction. 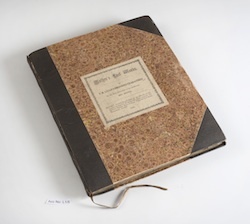 Embossed books also turned on a more physiological concept of the ‘feeling reader’. Distinguishing between a ‘feeling’ and a ‘seeing’ reader, Lucas recognised in 1837 that the finger tracks more slowly than the eye glances and stresses the importance of an alphabet based on contracted form, likening it to travelling on a smooth and fast railway. An enhanced understanding of and attention to tactile perception was needed to develop suitable finger-reading practices. A relief image of a detail of this work is available in the exhibition.